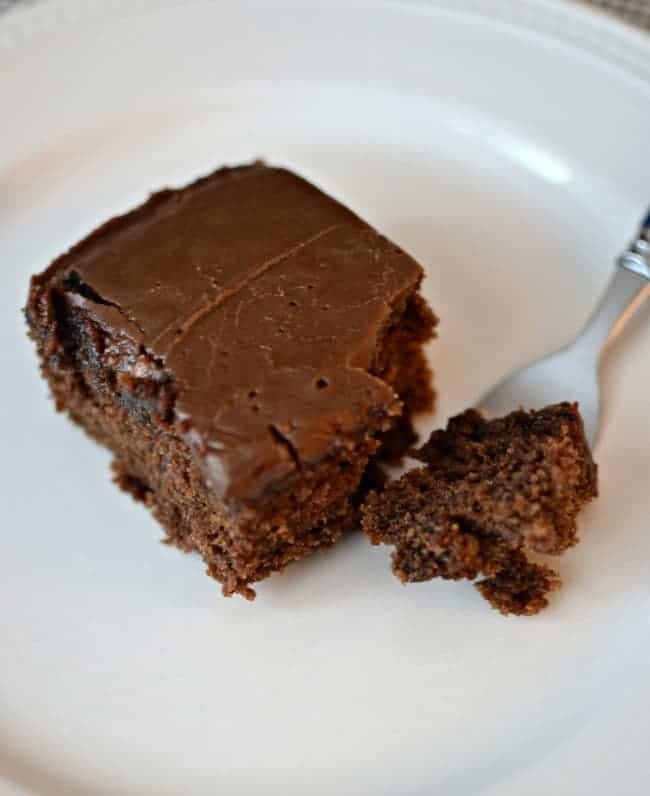 This rich, double chocolate coca cola cake made with real Coca-Cola is everything you want in a chocolate cake. It’s delish and a must try! 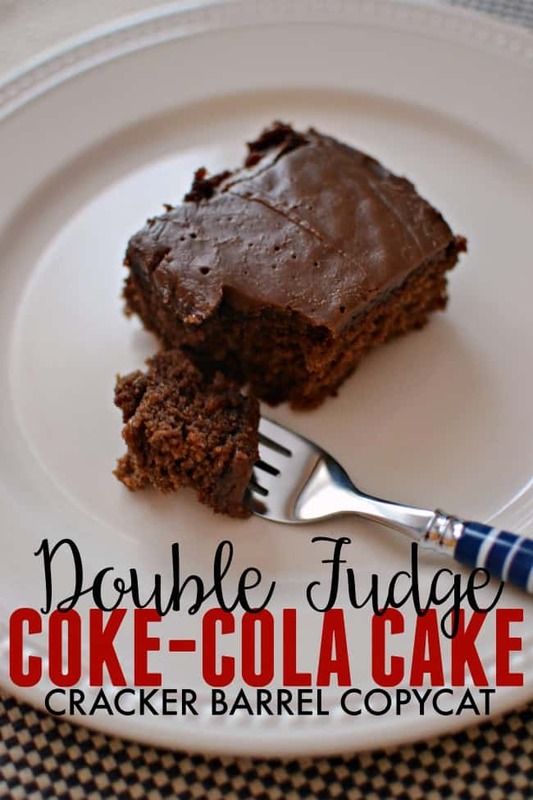 I love this double chocolate Coca Cola cake recipe and I also really love Cracker Barrel too. Unfortunately, the sad reality is I never make it to the dessert when I have dinner there. Whenever we get the chance to pop into one of our favorite restaurants I am always focused on filling up on all the tasty food. 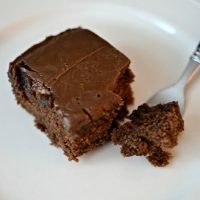 Always too stuffed for adding on my favorite desserts they offer, especially the Double Fudge Coca Cola Cake. So what is a girl to do? Make the homemade version, that tastes pretty darn close, at home. 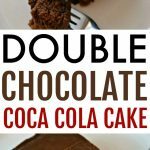 This double chocolate Coca Cola cake is easily one of the best chocolate cakes I’ve ever made or had in general. Spray 9×13 pan with nonstick spray or use a nonstick dish. Combine flour, sugar, salt and baking soda in mixing bowl. In a small saucepan, heat the butter, cocoa, coke-cola, and buttermilk until boiling. Pour over the dry mixture and mix thoroughly. Pour into prepared 9×13 pan. Bake for approximately 30 minutes. If a toothpick comes out clean the cake is done. During the last 10 minutes of baking prepare the frosting. In a small saucepan, combine butter, cocoa, and coke-cola. Whisk together and heat till boiling. Remove from heat and slowly whisk in powdered sugar. 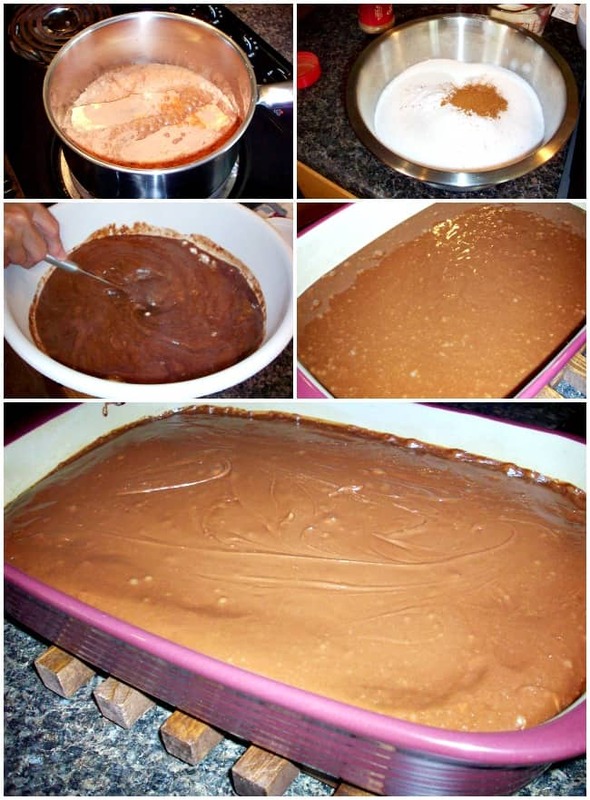 Remove cake from oven and slowly pour warm frosting over warm cake. Allow cooling long enough for the frosting to set up before cutting. Serve (with vanilla ice cream is great). If you don’t have buttermilk you can mix 1/2 cup milk and 1 tsp lemon juice. Allow it to set for 10 minutes (to thicken) and then mix with other ingredients just as you would the buttermilk. This recipe requires several ingredients but it is really simple, quick and easy to make. If you have a sweet tooth craving, especially for a rich chocolate treat, then definitely give this recipe a try. It is so yum and has the perfect fudge taste. It would make a great family gathering cake for any day or holiday of the year. Spray 9x13 pan with nonstick spray or use a nonstick dish. Pour into prepared 9x13 pan. Remove cake from oven and slowly pour warm frosting over warm cake. Add chopped pecans on top if you desire. Allow cooling long enough for the frosting to set up before cutting. If you don't have buttermilk you can mix 1/2 cup milk and 1 tsp lemon juice. The best peach cobbler recipe, just like your grandmother used to make.